Those of you who know me really well, know that I have a particular fondness for raptors. So much so, that I even spent some time working with a falconer near my mountain home in my younger years. Thinking back, I would do any volunteer job I could, just to be near those beautiful birds. 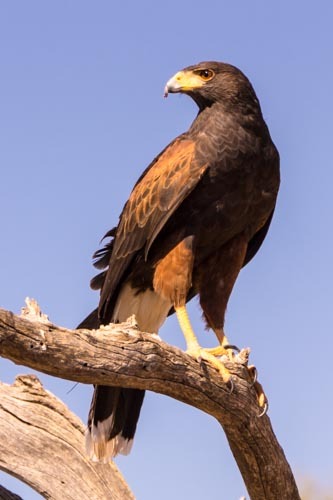 Which is why I was thrilled when I found out that I was visiting the Arizona-Sonora Desert Museum on the opening day of their Raptor Free Flight show. And I wasn’t disappointed one bit! Technically speaking, it was the “re-opening” of the show, as the birds take the summers off, and generally fly from October to April. Still, the presentation was excellent; in fact short of working with the Harpy Eagles up on the ridge, it’s one of the best raptor experiences I’ve ever had. It’s not so much a show, as the birds are pretty much in charge, even though their handlers are crouched out there in the desert. Still anything can – and does — happen, when these magnificent birds fly untethered across the desert (and over your head) without any jesses or leg rings. First up was a young Barn Owl who flew out over the crowd and landed on a branch just a few feet from us. There isn’t a bad seat in the house (well technically there aren’t any seats, as there is no amphitheater and the spectators just stand between rails) as the birds fly over the crowd and land in close proximity to the awe-struck audience. 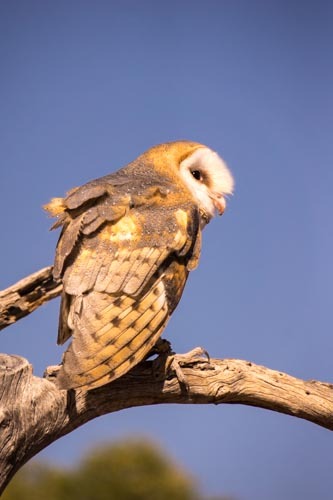 Still, they do have a mind of their own, and even Mr. Barn Owl took a few detours to scout out some potential prey. Next up was an excellent demonstration in group hunting skills by a quartet of Harris’s Hawks. With the young female in charge, they stalked their prey in unison, and eventually enjoyed the “kill” together. I say that parenthetically, as there wasn’t a live kill, but rather a simulated one (raw meat) provided by the stealthy trainers. It was an excellent – and very realistic — demonstration. The show is presented twice a day, and obviously I highly recommend it. That said, wheelchair-users and slow walkers should take some time to sort out their best viewing options. The path to the viewing area is well marked, however it is hard-packed dirt, and a steady (but gradual) trek down the hill. As mentioned before, there is no seating area, and spectators just stand between the guard rails. Power wheelchair- and scooter-users should have no problems with the descent (and subsequent ascent), but manual wheelchair-users and slow walkers might want to make alternative arrangements, as the walk back up the hill might be a little too strenuous. Museum employees recommend sitting in the Cat Canyon Ramada if the trail to the viewing area is beyond your ability. That said, I’d also bring some binoculars if you choose that option, as you won’t be as close to the birds. Additionally, if you have a sensitivity to heat, that is probably your best option as it’s the only shaded viewing area. If the sun isn’t a problem for you, then I suggest renting a scooter at the museum entrance. Not only will it allow you to power down (and up) the path to the viewing area, but it will make your whole museum visit more enjoyable. The museum encompasses 21 acres, and in order to see everything you really need to cover a lot of ground, so it’s best to save your energy and opt for a rental scooter. Whatever you do, don’t forget your water bottle, as the desert sun can really dry you out. Water is essential during the Raptor Free Flight show, and I refilled my water bottle several times during my visit. So plan ahead, hydrate, slather on the sunscreen and enjoy the Raptor Free Flight show at this popular Tucson attraction. It truly is a once-in-a-lifetime experience! This entry was posted in Attractions, Road Trips and tagged accessible travel, Arizona, attraction, disabled travel, museum, raptor, slow walker, sonoran desert, tucson, wheelchair by Candy B. Harrington. Bookmark the permalink.